We have a 6-8 person Sauna available for use at all times. We have a free Sauna Night with half hour sessions for members every week. Bookings are required. 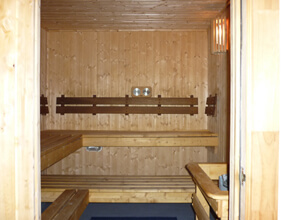 Sauna is a fantastic way to soothe and relax sore, tired muscles after a heavy training session. The skin is the largest organ of the body and plays a huge part in the detoxification process along with other lymphatic and immune systems. Sweating carries toxins out of the body and flushes them through the pores of the skin.